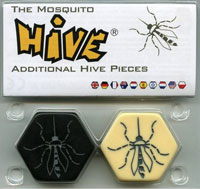 The Mosquito pieces can be added to a standard Hive set and are placed in the same way as other pieces. Once in play, a Mosquito can take on the movement ability of any creature of either colour that it is touching at the start of its move (a stack with a Beetle on top counting as a Beetle for this purpose), thus changing its movement characteristics throughout the game. Exceptions: If a Mosquito is only touching another Mosquito at the start of its move, it may not move at all. If a Mosquito is moved as a Beetle onto the top of the Hive, then it continues to move as a Beetle until it climbs down. I’m a fan of hive, and adding the mosquito adds in new strategies without drastically changing the game. The nature of the mosquito makes it the first reactive piece in the game, that actively changes role within the situation, giving you new avenues in dire situations, or acting as that last needed piece to seal the capture. It took me a while to track this down up here in Canada (it’s pretty easy to get now though). I really enjoy the addition of this piece. A must have for hive fans! Hive is a good game itself and it does not need expansions much. But it is a nice thing to add something to the mix. The Mosquito expansion adds one tile for each player, of course it is a mosquito tile. The new member of the hive beehives, I mean behaves, as a mimic. It has no movement alone it just copies a movement rule of any one of its neighbors. It looks attractive, but it turns out to be chaotic in real game. While it adds fun to the game it eventually lowers its strategic depth. If you want to add just one expansion to your Hive I would advise rather Ladybug then Mosquito. Add a Review for "Hive: Mosquito"